This article explains how to profit from matched betting slots. Online slots are part of casino offers, like blackjack and roulette, and can be very profitable. It’s a great way to supplement your sports betting income, especially during dry periods like summer. If you are a casual reader of this blog you can easily see why I like matched betting. If you don’t know what it is, here’s a nice 3-min video from OddsMonkey explaining the concept. Matched betting is my favourite side hustle which last year made me a nice £6,533 profit. I track and post my monthly profits on this page: How much can I make matched betting? Enough bragging. Off to the cheeky slots. Why cheeky? Because slots are one of the most profitable and stable ways for bookmakers to make money. Basically, here’s how it works. Every slot has a metric which is called RTP – Return To Player. This is not a secret and you can find out about each slot’s RTP on its page. Usually, they range from 94% to 97%. An RTP of 95% means that on average, if you stake £1 for 100 times, then you will get back £95. Now, this is not happening every time that YOU play, but on average. Which is how the bookmakers (and the real world casinos) make money. Some people win, some people lose, but on average, people lose more than they win. To beat bookmakers at their own game you need to understand how the expected value concept works. From the example above, a slot with RTP of 95% means that if you stake £1, 100 times, you will lose £5.00. In other words, your expected value (EV) is -£5.00. Depending on your stake, your expected value varies. So, if you only bet £50 on the same slot, your expected value will be -£2.50. The same concept applies in every single casino offer, whether that’s blackjack, roulette etc. So if you understand what the expected value is, you can then determine how profitable an offer is. Now in matched betting, we try to find value by hunting offers. You have probably seen the “Bet £20 get a free £10” sports bet. 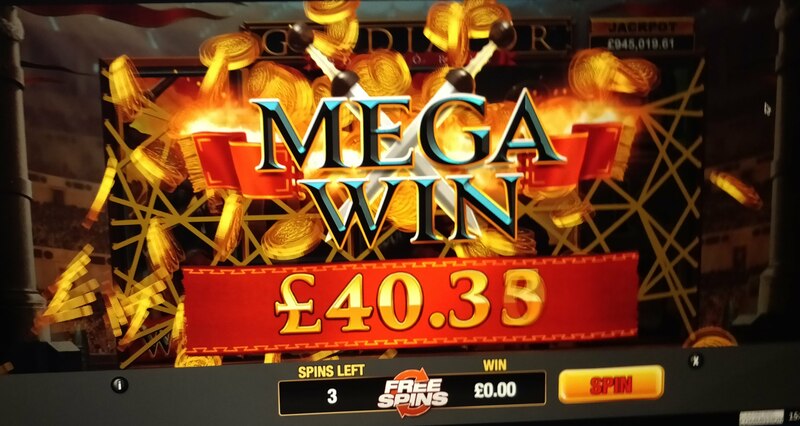 As you can imagine, there are plenty of “Wager £20 on selected slots, get £10 in free spins”. These are the offers we are after which leave profit on the table. Take this offer which I recently completed as found on OddsMonkey. 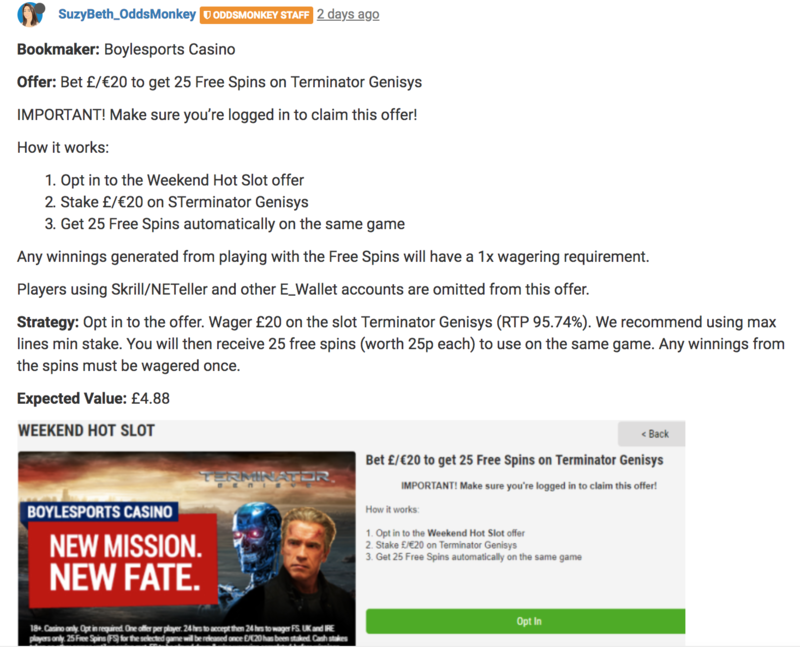 Offer: You need to stake £20 on the Terminator slot. Then you will receive 25 free spins of £0.25 value each, that you need to wager once (1X). The terminator slot has 95.74% RTP. To unlock the 25 free spins we need to wager £20.00 which will leave us with £20 * 0.9574 RTP = £19.15. In other words, we sacrifice -£0.85. We’re now ready to play with our free spins. How much did the bookmaker give us in monetary value? 25 free spins of value £0.25 each for a total value of £25 * £0.25 = £6.25. Playing our £6.25 on the same slot will leave us with £6.25 * 0.9574 RTP = £5.98. Those winnings need to be wagered once as per the description. One wagering will leave us with £5.98 * 0.9574 RTP = £5.73 final profit. Which matches the EV that OddsMonkey had calculated for us. Now, £4.88 is not a great deal of money but for a 10-minute job that’s a lot! Multiply that over time, and In other words, £4.88 per 10-minutes is equivalent to a £4,758 monthly salary! Try it yourself using this hourly wage calculator 🙂 Plus that’s tax-free money and thanks, I’ll take it. Of course, not every offer is going to return exactly the expected value. That’s because this is the average expectation. Sometimes, you will earn much more than that, sometimes you may even lose money in slot offers. But given you start doing those offers, your profits at the end of the month/year will match the expected value more closely. This is exactly how casinos and online bookmakers work. They expect some days to be more profitable than others. Occasionally they will lose a big chunk to some lucky gambler but they know that if people keep playing, having profits is a matter of time. Numbers never lie. Pro Tip #1: Trust the Expected Value. I know how it feels when you wager 20X and end up losing some money in the end. But that’s part of the game and the only way to make it profitable. Trust in the expected value, and the more you play the more profitable you will be if you follow the offers. Pro Tip #2: Don’t fall into the “one more spin” trap. Slots are addictive. 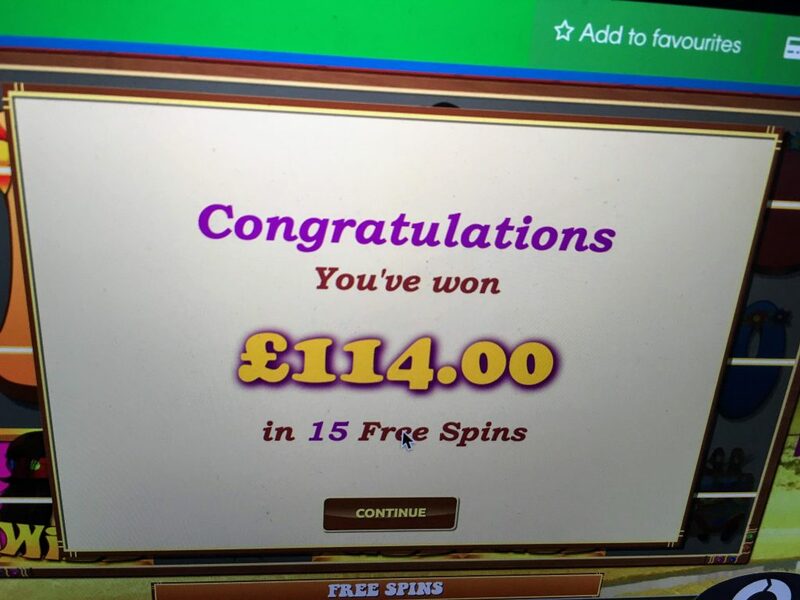 Once you start spinning, it’s easy to continue doing it with your own money once free spins are over. Especially if you didn’t win the “promised” amount. Be disciplined. Pro Tip #3: Take advantage of OddsMonkey (£17.99 per month) or another matched betting service for finding matched betting slot offers. Don’t research on your own because time is money when matched betting. Here’s my matched betting software comparison review. Also speaking with friends that have made hundreds of pounds matched betting slots, the best time to wager is after 23:00. Now that may be just a coincidence, but who knows if it’s just a myth. I believe slots are a great way to make an extra £200 per month when matched betting. My favourite offers are the ones that need sports wagering and give away free spins in return. Like Coral’s Bet £10 on Premier League weekend and get as many free spins as the number of goals scored. I have made some good money this way. Slots also help to distract bookmakers and avoid being gubbed on sports since casinos are usually a very profitable section for the bookmaker. Hope you liked this matched betting slots guide. Let me know your biggest win in the comments! Disclaimer: This is just a guide for educational purposes only and it does not guarantee any profits. I am not liable for any of your losses. As always, do your own research. You mention in the example a return of £4.88 for 10 minutes effort (i.e. ~£30/hr). Does that include the time for account signup? Do you track your time vs revenue? Is £30/hour typical to your earning? I guess you are picking off the highest earners on OddsMonkey first. Does the return drop off if you invest more hours? Thanks for your comment, Bobby. If I include the time for account signup then my hourly reward is going to be much higher. That’s because new signup offers are the most lucrative typically returning between £20-£50 for ~20 mins effort. However, you can only do them once. When it comes to slots I only pick the top offers on OddsMonkey and move my way down. They’re sorted by profitability anyway. Therefore, as you rightly said, spending more time will drop your earnings as you move to lower reward for time ratio. My matched betting hourly rate is around £30 per hour and I’m happy with that. I usually spend 4 hours per week doing it for a total profit of £500-£600 a month. That’s including sports which probably accounts for roughly 70% of my profits. Great info and I am happy to hear you’re making a decent hourly rate. I was thinking of committing 2-3 hours per week. My concern had been the rate would quickly drop below £30/hr. I’d say definitely give it a go for a few months. The beginning of the season is a good time to learn the ropes and there are very good offers usually. Also many people on the OddsMonkey forum are willing to help with more advanced strategies if you want to. Do you have any tips for avoiding getting gubbed from just doing slot offers? Great question. Usually, bookmakers will not ban you for slot betting unless you make some obvious mistakes. 1) Play one or two spins more than the wagering requires. Usually, people complete the wagering and then stop. 2) Don’t do offers only. Play an occasional spin without an offer, but be disciplined. Play £0.50 but not more – Do not gamble. 3) Try to look like a normal player. Play from your mobile phone, not only from your desktop. Explore the website and the promo page before opening a slot etc. Overall, I’ve found that it’s more likely to get gubbed by playing sports rather than slots. Hope that helps! Thanks for updating us with useful information. And your hourly rate idea is exceptionally well.